Following is a brief summary of our eventful week at Sun'n Fun which ended this past Sunday. The following post was sent out as part of a Zenith Aircraft E-mail Updates sent out earlier today to Zenith builders and enthusiasts. (Click here to subscribe to the free Zenith Aircraft E-mail Updates service). I've also added a few links at the bottom of this post to more videos and news coverage of the tornado, as well as a video clip of the Zenith booth right after the storm. Again, I want to thank all of you who have called or e-mailed offering your support. We truly appreciate it and are thankful for such great customers! The Zenith Aircraft Company display at Sun'n Fun, before the storm. This year's Sun'n Fun Fly-In was an event to remember! As widely reported, a severe storm with a tornado swept through the fly-in convention in Lakeland, Florida, pushing right through the Zenith Aircraft display on March 31, 2011. Thankfully none of the Zenith crew was injured, but three aircraft in the Zenith booth were destroyed and the Zenith display tent was completely flattened, (while two aircraft were left untouched). Zenith's STOL CH 750 light sport utility factory demonstrator aircraft was violently flipped over in the storm. The bright yellow airplane was featured in news stories as news of this sudden storm briefly made headlines across the nation and around the world. "This storm was devastating but we are very thankful that no one was hurt," explained Sebastien Heintz, president of Zenith Aircraft Company. "We know how to build airplanes, and as a kit manufacturer we have a good source of parts to build new ones!" Heintz was also very thankful for all the support that has been offered by Zenith builders since the storm. The high-wing STOL CH 701 light sport utility kit aircraft on display was scheduled to be donated to the Wings for the Word missionary organization for use in Tanzania, Africa, on the day following the storm. Headed by Burl Nelson, the "Spirit of Hope" STOL aircraft was built by volunteers for the missionary organization. Wings for the Word states that "donations toward a replacement airplane are being gratefully accepted." The third Zenith aircraft destroyed was built and owned by I-Tec (Indigenous People's Technology and Education Center) in Ecuador, South America. Headed by the Saint family, several Zenith STOL airplane kits have been built by I-Tec, including the four-seat STOL CH 801 utility aircraft (equipped with a cargo pod). I-Tec's other projects include the Maverick "flying car". We look forward to both more sun and fun (and fewer storms) at next year's Sun'n Fun Fly-In. Earlier in the week at Sun'n Fun, Zenith Aircraft Company presented the UL Power line of light aircraft engine installations for the two-seat Zenith kit aircraft designs. These are modern technology, direct drive, air cooled, light weight and high fuel efficient aircraft engines. The current product line ranges from the UL260i at 97-hp to the UL350iS at 130-hp. The modern engines are horizontally opposed four cylinder engines with FADEC (Full Authority Digital Engine Control) multipoint electronic fuel injection with automatic altitude and temperature compensation. "We've been impressed with UL Power and the technology that they bring to the light aircraft industry," stated Sebastien Heintz of Zenith Aircraft Company: "For many years our customers have been asking for lighter, more fuel efficient engines, and for modern technology such as FADEC. UL Power appears to deliver both high fuel efficiency and great power to weight ratio, while also being simple, with conventional direct drive and air cooled cylinders." Both the 97-hp UL260i and the 130-hp UL350is can be installed on Zenith's two seater aircraft, including the high-wing STOL CH 701 and the larger STOL CH 750 or low-wing CH 650 B cruiser. Zenith Aircraft Co., in conjunction with UL Power North America LLC, is developing full firewall-forward (FWF) packages for these engines to be able to supply builders with "plug and play" ready-to-install powerplant package for the Zenith kit planes. Zenith builders can choose from a wide range of light aircraft engines to power their Zenith kit project, whether the proven Continental O-200 engine, auto engine conversions, or modern aircraft engines from Rotax or Jabiru. 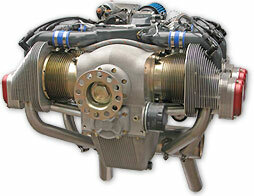 The UL Power engines present builders with a new choice for a truly modern light aircraft engine. We used the Zenith Facebook page to post updates during the storm at Sun'n Fun (using our cell phones to share photos) and we plan to continue to keep you posted of the latest news and coming events at Zenith Aircraft Company using the popular Facebook page, and to share with you our building and flying adventures. "Like" our facebook page for automatic updates. Here are a few additional links with more info and photos. Feel free to share your own links (comment below). Sebastian, I was there all week and talked with you guys several times. I did not get a chance to give you a hand cleaning up or tell you how sorry I felt for you and all of the other aircraft manufacturers and aircraft owners due to having my campsite destroyed and struggling with a back injury. I wish you guys the best and hope your business fully recovers soon. I have N750ZA reserved with the FAA, and I was going to use this as my registration number, however I would like to offer this registration number to you for use on the relacement demonstrator aircraft. Take care, and get some well deserved rest. Mike Hammond. Thankfully no one was hurt. I hope the repairs go well!! Just glad to hear that no one was hurt there. Sebastien, my heart goes out to all of the Zenith crew that work so hard to make events like this successful. What a shame. Just last week I was grieving the fact I could not make it down this year, who knew! Thank goodness no one was seriously injured.